Thundering far beneath Manhattan’s thronging streets came the Death Express — a crack New York Central train bearing a gruesome cargo of lifeless men, women and children — their bodies stripped of valuables, naked and mutilated! A grim warning of the terror-reign that threatened America — at the hands of Twentieth Century land-pirates, whose weapon was neither gun nor sword, but the stunning, body-shivering force which lies in electricity! Can the Spider, using mortal weapons, fight the numbing power of the thunderbolt — and survive? During his ferocious first year fighting crime, The Spider faced the most amazing array of supercriminals ever spawned. The Black Death. The Red Mask. The Tarantula. The Fly. Few were as memorable as the 20th Century corsair called Captain Kidd. She—yes, she!—embarked on a campaign of cruelty unmatched in pulp history. 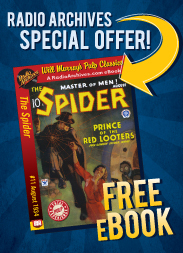 It began with the torture-killing of a innocent young boy—a loyal member of the Spider Club. The weapon employed was a knife with eerie electrical properties. Discovering the hapless body, Richard Wentworth vowed to avenge this insult to The Spider's power. But Captain Kidd struck first! When a train roars into Grand Central Station, out of control and crashing to a brutal halt, authorities discover that everyone aboard, from the engineer and crew to the passengers, are cold corpses—electrified by a weird new weapon called the Green Fire! Out of this rolling charnel house come the first clues to the Pirates—a roving band of modern-day buccaneers out to pillage greater New York. At their head, the deadly woman who has taken the feared name of Captain Kidd. Nick Santa Maria once again brings the Spider to life in The Corpse Cargo. Originally published in The Spider magazine, July 1934. Chapter 13: Surrender ... or Nita Dies! Chapter 19: The Pirates Are Coming!